I’ve struggled with coffee for years. I know I really shouldn’t drink it because of my blood pressure, except that a little caffeine speeds up my slow heartbeat and actually lowers my blood pressure temporarily. It’s just that when the caffeine wears off — and my heart rate drops — my blood pressure soars back up to what’s normal. Fun with my wacky metabolism. For the moment, I’ve weaned myself back to one cafe au lait a day now. That’s enough. 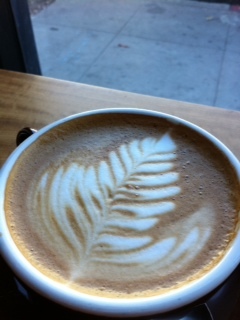 I’d gotten to the point where a latte was leaving me too jittery to be happy. I miss the lovely designs an expert barista could paint in the milk foam, but aesthetic pleasure loses out to a desire to keep my hands from shaking. Every so often I force myself to give up caffeine. I go cold turkey and endure the headaches. As much as I like tea, though, I always come crawling back to coffee. My brain feels too fuzzy and I crave the clarity that only roasted beans can provide. Unfortunately, I feel like coffee in San Francisco suffers from what I call the War on Drugs effect. Many years ago, when I was young and dinosaurs roamed the earth, you could sit around with a group of friends and smoke a couple of joints and have a pleasant social experience. Then the War on Drugs attacked the recreational growers. To maximize profit and minimize risk, pot farmers bred stronger crops in search of one-hit weed. In consequence, marijuana became so potent that one puff got you so high that you couldn’t do anything more than gape at the TV. The social aspect was destroyed. Smoking pot ceased being fun. Coffee is headed that way now. I can’t finish a small cup of Ritual Coffee. Even Blue Bottle’s decaf makes my hair follicles tingle. Coffee has gotten so strong that it’s assaultive. And yet I haven’t been able to quit it for good. I continue to search for the perfect au lait, my fix of frothy milk and medium roast, never bitter, not too sweet, something to light my way without jolting me from my chair. When I go to a cafe, I want to sip some coffee, feel the thoughts stir, and be able to sit still long enough to write. I want caffeinated aid to capture lightning in a bottle, to cage words in blue ink. This entry was posted in writing, Writing advice and tagged quitting coffee, writing in cafes. Bookmark the permalink. I love your last sentence! I love coffee too and have slowly seen switching to decaffeinated for my BP but it has to be STRONG. Yet I still have to have a hit of caffeine every now and then. Good post. I think it doesn’t help that decaf is so often an afterthought in cafés. They’ll have four kinds of regular coffee, but only one burnt, bitter decaf. I’m glad to know I have company in the struggle.